Nazarin has a two-and-a-half-month old daughter. Born this July, two months before the due date, the girl looks extremely frail as the two wait for the doctor at a community health centre in Ghaziabad district of Uttar Pradesh. 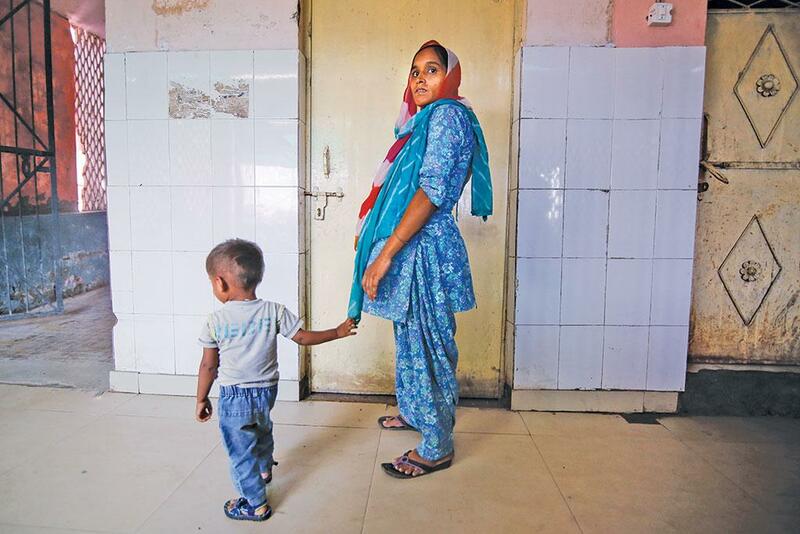 In March, Nazarin registered for the Pradhan Mantri Matru Vandana Yojana (PMMVY)—the Union government’s maternity benefit scheme that seeks to ensure pregnant women get proper nutrition—and should have received Rs 1,000 in her bank account by May. 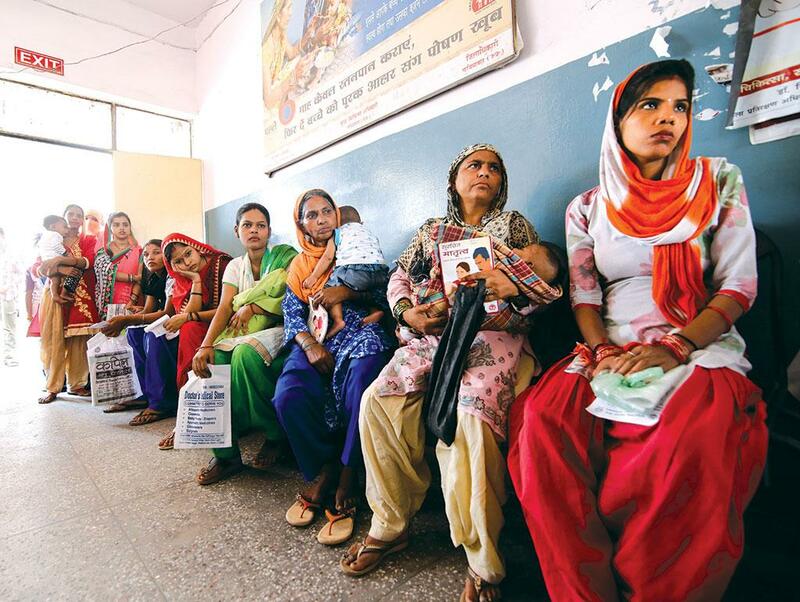 The rules of the scheme say that the first instalment of Rs 1,000 should be transferred before the completion of the fifth month of pregnancy, the second instalment of Rs 2,000 after the first antenatal checkup and the third instalment of Rs 2,000 when the birth is registered and the first set of vaccination done. But even by the end of September, Nazarin says, she has not received any money. Nazarin’s is not an isolated case. Y K Sandhya from Sahyog, a non-profit working on issues related to reproductive health in Uttar Pradesh, says there are reports from all districts of the state about women not receiving any money. According to Sachin Jain from Vikas Samvad, a non-profit in Madhya Pradesh, a majority of the babies born in the state are not getting the benefit under the scheme. Since the Cabinet approved the scheme in May 2017, with effect from January 2017, over 25 million babies have been born in the country, as per Health Management Information System, an online portal run by the Union government. But only about 3.2 million women have received cash under the benefit scheme till August 26, 2018, according to a query filed under the Right To Information (RTI) Act by Delhi-based journalist Somrita Dude. PMMVY was announced by the prime minister on December 31, 2016, when he said that all pregnant women across the country will get an incentive of Rs 6,000. The scheme was in accordance with the National Food Security Act (NFSA), 2013, which makes it mandatory for the government to provide Rs 6,000 to every pregnant and lactating mother to ensure nutritional support to women and children. But when the scheme was cleared by the Cabinet, its form and shape had changed. First, it was only applicable to the first live birth. Second, only women over 19 years were eligible. Third, it was limited to only institutionalised deliveries. And fourth, instead of Rs 6,000, the cash incentive was reduced to Rs 5,000. The Cabinet announcement said that Rs 1,000 were to be used for the services provided during institutional deliveries under the Janani Suraksha Yojana (JSY). All these clauses have resulted in exclusion of a large number of pregnant women from the crucial benefit scheme. Limiting the scheme to only the first live birth excludes a majority of pregnant women in the country. On an average, 43 per cent of children born every year in India are firstborns, says Sample Registration System (SRS) 2014, undertaken by the Office of the Registrar General and Census Commissioner of India. This means that the remaining 57 per cent would be out of the purview of the scheme. “It is strange that the government does not deem it necessary to ensure nutrition of the second or third child,” says Sejal Dand from Mahila Kisan Adhikaar Manch, a Telangana-based informal forum working on issues related to women farmers. Moreover, limiting the scheme to firstborns is contradictory to NFSA, which guarantees all pregnant and lactating women Rs 6,000. “A government scheme cannot be in contravention of an Act of Parliament. Only Parliament can amend an Act,” says Dand. The firstborn norm also means that states with high fertility rates would face greater exclusion. For instance, states like Bihar and Uttar Pradesh, which are underdeveloped, malnourished and poor, have fertility rates of 3.4 and 2.7. But these have not benefitted much from PMMVY. In Uttar Pradesh, not a single woman had received money under PMMVY in Uttar Pradesh till August 26, 2018, as per the RTI query filed by Dude. 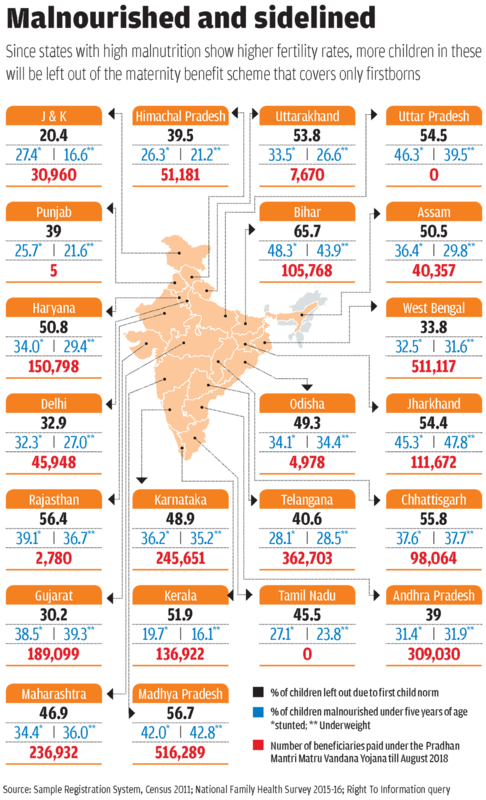 The figures for Uttarakhand and Assam were 7,670 and 1,503. The best performing states were Madhya Pradesh, West Bengal and Telangana (see ‘Malnourished and sidelined’). Also, the fertility rate in rural India is 2.5, while the figure for urban India is 1.8, according to SRS 2015. There-fore, the scheme will hurt women in rural areas more. Even the National Family Health Survey (NFHS) 2015-16 says that women in the lowest wealth quintile have an average of 1.6 more children than women in the highest quintile. As a result, the poor will face greater exclusion. According to Census 2011, about 30 per cent of women in the country are married before they turn 18. They would be excluded from the benefit if they become pregnant before turning 19. “A large number of women in India have no control over when they marry or conceive. They are being punished for no fault of theirs,” says Dand. As per NFHS 2015-16, about 80 per cent deliveries in the country do not take place in hospitals. Since the scheme is only for institutionalised deliveries, these women will not be covered. “Those who do not come to hospitals are the ones who really need monetary help. Why are they excluded? A majority of states are still struggling to ensure 100 per cent institutional delivery,” argues Jain. Even the clubbing of PMMVY and JSY to reach the figure of Rs 6,000 is problematic. Dipa Sinha from Right to Food Campaign, a Delhi-based network dealing with a variety of public issues, says it is wrong to club the two schemes because they are for different purposes. While PMMVY is to ensure nutrition, JSY is to encourage institutionalised deliveries. Moreover, there are many states, such as Himachal Pradesh and Maharashtra, that offer only Rs 700 under JSY. The sum of cash benefits under the two schemes in such states will not reach Rs 6,000, which is the minimum amount mandated under NFSA. “NFSA is the umbrella law and PMMVY has to be guided by it. It cannot be the other way round,” says Sudeshna Sengupta, a Delhi-based activist working on issues related to food security. Only two states in the country—Tamil Nadu and Odisha—have their own maternity benefit schemes and these offer more benefits than PMMVY. In Tamil Nadu, the government runs Dr Muthulakshmi Maternity Assistance Scheme which provides pregnant mothers Rs 14,000 in cash and a nutritional kit worth Rs 4,000 for the first two pregnancies. When the scheme was launched in 1987, the cash incentive was Rs s 300. The Odisha government runs Mamata maternity benefit scheme which provides Rs 5,000 for the first two pregnancies of all women. “For vulnerable groups, like tribals, the money can be given for even the third birth,” says Bidyut Mohanty, secretary of Society for Promoting Rural Education and Development, an Odisha-based non-profit working on issues related to the marginalised communities. The success of Mamata was also corroborated in a study published in PLOS One in December 2017. The study found that over 95 per cent women spent the money provided under the scheme on food and medicine. However, like PMMVY, the maternity benefit schemes of Tamil Nadu and Odisha are only applicable to women above 19 years of age. The ill-conceived scheme has even drawn the attention of the Supreme Court. In July 2018, while hearing a 2015 petition filed by People’s Union for Civil Liberties, a Delhi-based human rights organisation, the court asked the government to respond to issues related to the exclusion of a large number of women and the delay in the implementation of the scheme. “The government is yet to file a response,” says Aditya Shrivastava, an advocate fighting the case.